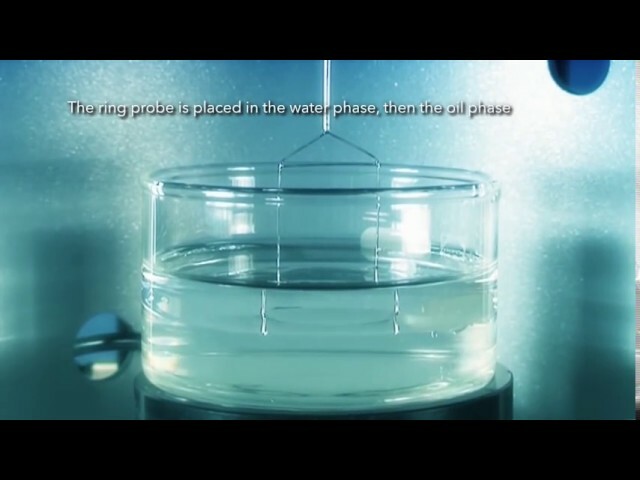 Force tensiometry is a powerful and accurate technique to measure surface tension, interfacial tension, critical micelle concentration, dynamic contact angle, surface free energy, powder wettability, sedimentation and density. These measurements allow the determination of a number of material and surface properties, such as, wettability, adhesion, absorption, adsorption, cleanliness, spreading, porosity, material solubility, biocompatibility and lubricity, to name but a few. Force tensiometry has become the method of choice for many industrial standards related to characterization of liquids. It is also the most widely used technique for measuring critical micelle concentration of surfactants. In addition, it is the only method to determine the absorption and contact angle of a packed powder or of fiber beds using the Washburn method. The wetting of textiles and individual fibers can also be studied with Sigma force tensiometers. When a solid touches the surface of a liquid, the liquid tends to be drawn up in a meniscus. The force exerted by the meniscus is measured and analyzed to determine surface tension. Using high surface free energy probes such as a platinum Du Noüy ring or Wilhelmy plate allow precise measurement of these forces. All Sigma force tensiometers measure surface and interfacial tension using plates or push and pull modes by ring. Correction calculations for rings are made using models from Huh and Mason (Harkins and Jordan, Zuidema & Waters and others also available). Sigma 700 and 701 are state-of-the-art force tensiometers, providing highly accurate measurements of surface and interfacial tension, dynamic contact angles and fully automatic cmc determination. Full computer control and a high level of automation make it possible to carry out long measurements without operator intervention during the test, saving time and freeing the user to concentrate on other tasks. Special attention has been paid to the ergonomic and user-friendly design. Sigma 700 and 701 are outstandingly versatile, making them suitable for research and development, industrial quality control, routine measurements and even educational use. These software controlled force tensiometers come with the OneAttension software for unparalleled performance and usability. OneAttension provides all the following measurement capabilities in one package: surface and interfacial tension, dynamic contact angle, cmc, density, powder wettability and sedimentation. OneAttension enables Sigma 700/701 to perform fully automatic measurements. Select readymade experiment recipes or create custom programs for quick and repeatable operations. Probe and sample immersion and withdrawal cycle(s) can be easily programmed. Experimental parameters such as liquid and solid used, temperature or sample concentration (during cmc measurement) can also be controlled. It is possible to carry out long measurements without operator intervention, saving time and freeing the user to concentrate on other tasks. The complete automation also avoids user dependant variation when conducting routine measurements and quality controls. A simple step by step powder protocol allows simple powder wettability measurement. Two liquid dispensers can be used simultaneously for cmc measurements, enabling fully automatic CMC measurement. Accessory modules for dispensers, temperature or pH control can be easily mounted into the measuring unit. In addition, special probes are available for density, sedimentation and tensiometry measurements as well as holders for powder, fiber and plate studies. Because of its wide weight range and autocalibrating microbalance, the Sigma 700 is well suited for dynamic contact angle measurements of large and heavy solid and powder samples. Very similar to Sigma 700, Sigma 701 is also a multipurpose force tensiometer. Sigma 701 can measure in a narrower weight range but with improved sensitivity, optimized for fiber measurements. Sigma 702 and Sigma 702et are standalone force tensiometers offering high resolution and precision for surface and interfacial tension measurements, as well as manual cmc determination. Results are displayed on a large integrated digital screen. Precise temperature control can be ensured by the integrated water-jacketed vessel holder which is directly mounted on the motorized sample stage. The open design and convenient control keyboard operations make Sigma 702 and 702et extremely easy to use instruments. Sigma 702et is specifically designed for oil-water interfacial tension measurements in line with ASTM and IEC standards. An embedded software specifically designed for oil-water measurements is provided with the Sigma 702et. Both can be connected to an external pc for additional data storage and simple reporting. Data receiver software is provided with the instrument. Sigma 703D is a simple standalone and robust digital force tensiometer for accurate measurement of surface and interfacial tension of liquids by DuNouy ring or Wilhelmy plate method. Non-automatic cmc measurements can also be conducted. Measurements are displayed in realtime on the large digital screen integrated into the instrument and can be transferred to a computer using the data receiver software. When quick and reliable stand-alone operation and manual control are valued, Sigma 703D is the best solution. The major difference between the Sigma 703D and Sigma 702 models is the manual sample stage of Sigma 703D.